by creating a claustrophobic, conceptual environment in which images take on iconic readings. The picturesque family snapshot, for example, is mingled with the crisp square framework of a computer game level, creating a particular sense of scale and abstracted sense of space. The work in an autobiography, a childhood memory of a house fire. 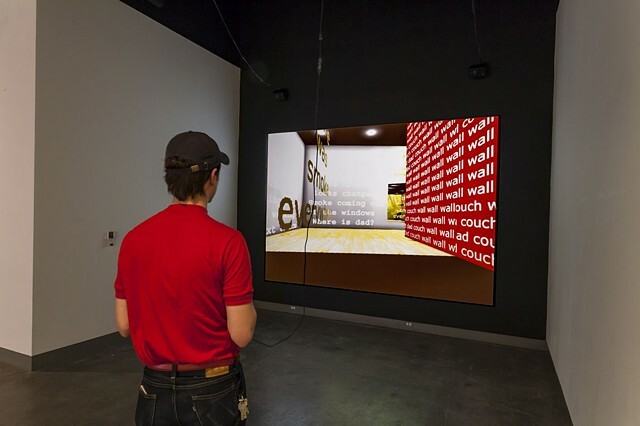 Created primarily of texts from within and extruding out of the walls, the work’s creation of the virtual house becomes a container for memory, a movements from the memory. Players shoot “coping mechanisms” at the walls and at the growing fire within the space in order to contain it as it threatens to consume the world—and the player. This personal work on memory poses questions about the ways space and memory are cognitively tied, and can such ties be re-experienced? What is the role of narrative and memory in computer games, and how do game environments, particularly the physical architectures constructed in game environments, radiate cultural and social meanings? The geometry, the “map,” fragments both language and the cohesion of the space, and as a result, evokes trauma – in this play environment, there is no sense of closure, no sense of resolution or successful narrative cohesion. Because the game is built in the Unreal Tournament 2003 engine, there is an anxiety produced between traditional 3D action play and the exploratory nature of the [domestic] experience, as well as a tension generated between popular 3D games’ post industrial spaces and the more abstract home space created in [domestic]. [domestic] premiered at the Playthings exhibition in Sydney Australia in October 2003, organized by DLux media|arts.